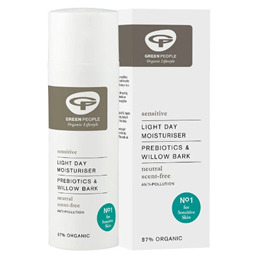 A light, fragrance-free skin-balancing organic moisturiser for ultra-sensitive skin. Aqua, Butyrospermum Parkii Butter*^, Helianthus Annuus Seed Oil*, Olea Europaea Fruit Oil*, Glycerin*, Squalane, Cetyl Alcohol, Cetearyl Glucoside, Cetearyl Alcohol, Elaeis Guineensis Oil*^, Simmondsia Chinensis Seed Oil*, Alpha-Glucan Oligosaccharide, Glyceryl Stearate, Aloe Barbadensis Leaf Juice Powder*, Perilla Frutescens Seed Oil*, Persea Gratissima Oil*, Rosmarinus Officinalis Leaf Extract*, Chamomilla Recutita Flower Extract*, Salix Nigra Bark Extract, Ananas Sativus Fruit Extract, Hydrolysed Jojoba Esters, Fucus Vesiculosus Extract, Sodium Stearoyl Glutamate, Citric Acid, Benzyl Alcohol, Salicylic Acid, Sorbic Acid. After cleansing, apply Light Day Moisturiser in the morning to a freshly cleansed and toned face and neck. Use gentle stroking movements. 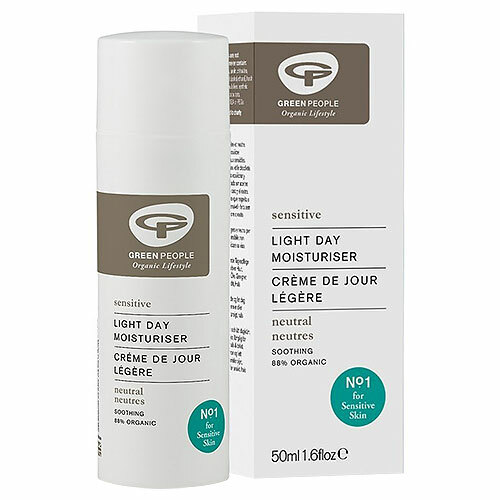 Below are reviews of Green People Scent Free Light Day Moisturiser - 50ml by bodykind customers. If you have tried this product we'd love to hear what you think so please leave a review.